They started painting the Wall opposite of Tacheles sponsored by an overpriced italian demin company with a good marketing division. 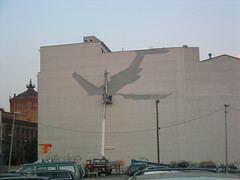 So far it looks like a plane. 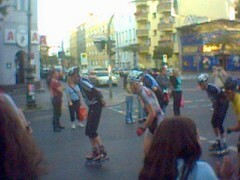 Some rather bad impressions (mobile phone’s camera) from yesterday’s skater day. Posted in Uncategorized | Comments Off on Run, Forrest, Run! 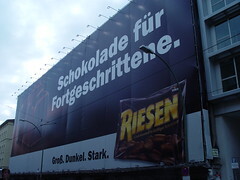 Musikmarkt tells us that we won’t be spared. :( There will be a new “Love Parade” in June, 2006. But it won’t be called “Love Parade”, but “B-Parade” (Berlin Street Parade). And listen to this, finally it won’t be a demonstration either, but registered as a “regular” event. Who would have thought? Sad, sad. Since I am an avid supporter of all those political statements (about love and world peace) made on LSD and XTC. I also read that the makers of the “B-Parade” will not only torture us with Techno, but with the entire spectrum of electronic music. So I guess it’s time to book a cheap flight (with HLX, easyjet, Air Berlin, Virgin Express, flyDBA or whoever) to spend the weekend somewhere else. Let’s see whether this will be cool or not. Is there anyone who will be there too? “Webcuts04+05 presents the best internet films of the past two years on Thursday, October 6th, 2005, up close in Berlin and worl-wide via live streaming on the web. Be witness to an extraordinary transformation: What was made for the computer screen, looks even better on the big cinema screen! 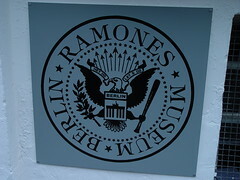 Posted in Uncategorized | Comments Off on Hey ho! Let’s go! The advanced elections are over and the result really pisses me off. Apart from my political preferences I would have hoped for a clear result, either for the politicians in charge or for the opposition. Now both of the big parties lost and are only divided by a small margin of under 1 percent. What we saw on tv last night was grotesque, each party was trying to blandish their results. No one really had the balls to admit mistakes or to honestly say, that they lost.